What follow is how to set up as SSH tunnel using PuTTY with the MySQL port (3306) forwarded as an example. 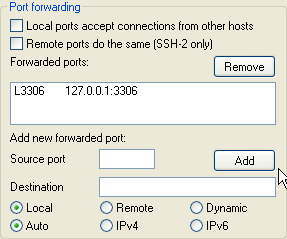 After completing this how-to you'll have port 3306 on your local machine listening and forwarding to your remote server's localhost on port 3306. 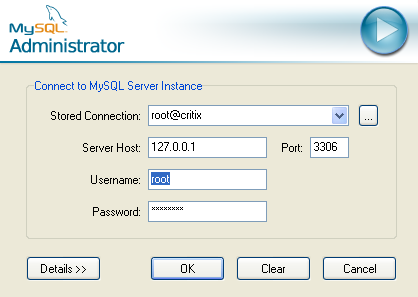 Thus effectively you can connect to the remote server's MySQL database as though it were running on your local box. This how-to assumes your MySQL installation has enabled listening to a TCP/IP connection. Only listening on 127.0.0.1 is required (and the default as of MySQL 4.1). Although beyond the scope of this how-to, you can verify the server's listening by using mysql -h 127.0.0.1 rest of options on the server. Look for bind-address = 127.0.0.1 and skip-networking = 0 in your /etc/mysql/my.cnf. Also, a trouble-shooting guide. To achieve the same with PostgreSQL simply use PostgreSQL's default port, 5432. psql -h 127.0.0.1 rest of options to test; /etc/postgresql/pg_hba.conf and the manual as pointers for configuration. Create a session in PuTTY and then select the Tunnels tab in the SSH section. In the Source port text box enter 3306. This is the port PuTTY will listen on on your local machine. It can be any standard Windows-permitted port. In the Destination field immediately below Source port enter 127.0.0.1:3306. This means, from the server, forward the connection to IP 127.0.0.1 port 3306. MySQL by default listens on port 3306 and we're connecting directly back to the server itself, i.e. 127.0.0.1. Another common scenario is to connect with PuTTY to an outward-facing firewall and then your Destination might be the private IP address of the database server.